Loudwire Premieres New Installment In "The Vikings Are Coming!" The Chicago Open Air music lineup leads off with a rare U.S. festival appearance from rock legends KISS (headlining Friday) as well as one of the first solo performances from Ozzy Osbourne (headlining Sunday) since the final Black Sabbath tour, where he will reunite with guitarist Zakk Wylde after a decade apart. Rock heavyweights Korn will headline Saturday. General Admission and VIP tickets are on sale now at www.ChicagoOpenAir.com and no service fee tickets are available at all Chicago-area Kuma's Corner locations. In addition to music, a number of special events, onsite attractions and festival partners make Chicago Open Air a must-attend destination. Here is a list of what attendees can expect. Danny Wimmer Presents will be hosting the official Chicago Open Air Kickoff Dinner, held at Kuma's Corner (2900 W. Belmont) on Thursday, July 13 at 7 p.m. For $50, attendees will be treated to burgers, appetizers and beer, and will have the chance to hang out with host Jose Mangin from SiriusXM's Liquid Metal. A limited quantity of only 100 tickets will be available at www.ChicagoOpenAir.com. Festival attendees can savor a variety of local and regional cuisine throughout the weekend including selections from Bruges Brothers, Chicago Doghouse, Crème of the Crop, Dia De Los Tamales, Dinky's Donuts, Kuma's Corner, Pizano's (Chicago deep dish), and Yum Dum. Additional Gourmet Man Food vendors will include: Aporkalypse Now, Porkchop, The Big Cheesy, Ben's Burrito Bowl, Master of Patties, Pie Baby (wood-fired pizza) and The Cheesies Truck. Presented by Decibel Magazine, this unique metal themed dive bar is returning to Chicago Open Air. Headbangers Bier Hall will feature national and regional craft beers and artist inspired beverages including: Goose Island (Chicago — 312 Urban Wheat Ale, Four Star Pils), Half Acre Beer Company (Chicago — Daisy Cutter Pale Ale, Vallejo IPA, Pony Pilsner), Iron Maiden's Trooper Beer, Lagunitas (Petaluma, CA — IPA, A Little Sumpin' Sumpin'), Motörhead Wine, Revolution Brewing (Chicago — Fist City, Rev Pils), Surly (Minneapolis — Surly Hell Lager, Surly Furious IPA), Two Brothers Brewing (Chicago — Sidekick Extra Pale Ale, Dog Days Dortmunder Style Lager), and more to be announced. Look for unique experiences throughout the weekend. 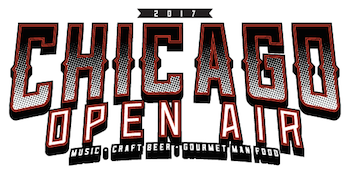 Chicago Open Air will feature a variety of unique entertainment offerings to go along with its incredible music, food and beverage lineup, including the Monster Energy Experience (featuring signings with Chicago Open Air artists), the Jack Daniel's Experience, The Music Experience, Ellefson Coffee House, Caduceus Cellars & Merkin Vineyards Wine Garden, Heavy Tiki Bar, Kuma's Corner, BlackCraft apparel shop, FYE Fan Experience (hosting artist signings and pop-up performances with artists from participating record labels Roadrunner, Century Media / Another Century, Nuclear Blast / SharpTone Records, Spinefarm and Razor & Tie), Fxck Cancer and the Dyin 2 Live Dreams program, and Take Me Home animal rights advocacy foundation. Chicago Open Air sponsors include: Monster Energy, Jack Daniel's, FYE, Dyin 2 Live / Fxck Cancer, Take Me Home Animal Rescue, The Music Experience, Roadrunner Records, Century Media Records and more to be announced.